Filling the void of pirate media before Johnny Depp, Bill Kopp developed Mad Jack the Pirate. The series followed the adventures of Mad Jack (Kopp), a cowardly, clumsy, inept, disgrace of a pirate who was convinced of his own superiority in everything. 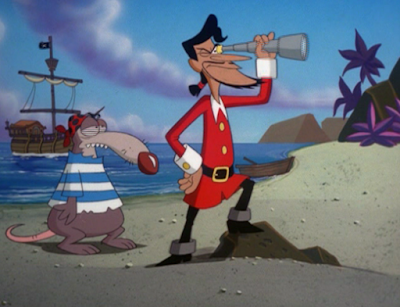 He captained The Sea Chicken with his faithful anthropomorphic rat first mate, Snuk (Billy West). Snuk was only marginally smarter than Jack, and never hesitated to point out his captain’s shortcomings. The pair always set out in search of buried treasure or to claim a reward but were often thwarted by circumstances and their own ineptitude. Jack, Snuk and The Sea Chicken. Initially, Mad Jack was to be named Red Hook until Kopp discovered that a beer company was already using the name and wanted to avoid any issues. The inspiration for the show came from the British comedy series Blackadder, which followed a man bumbling through various periods in history. Kopp set the series on an alternate flat Earth-like planet where he could be fast and loose with history and create unpredictable events. That meant the inclusion of anachronistic things like cars, cameras and movies. While Jack and Snuk were the principal characters, a variety of other equally bizarre characters made appearances with frequent vocal contributions by Jess Harnell, Robert Pike Daniel, Tom Kenny, Charlie Adler, Cam Clarke, Sandy Fox, Brad Garrett, Kevin Meaney, Valery Pappas and April Winchell. Mad Jack the Pirate debuted on FOX’s Fox Kids programming block on September 12, 1998. Most of the episodes contained two segments apiece. Fox Kids was at this point owned by Saban Entertainment, who had a hand in producing the show with Fox Arts Animation Studios and Bill Kopp Productions. Kopp served as a producer and voice director, as well as wrote the majority of the scripts. 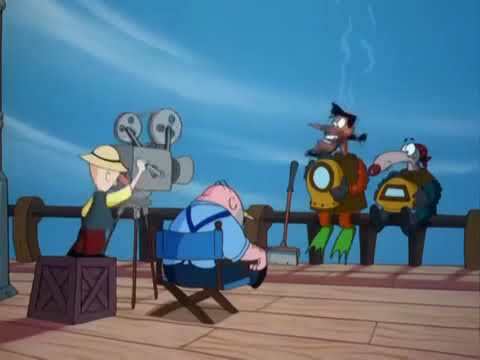 Other writing was done by Steve Ochs (who also contributed some voice work), Huub Dikstaal (who also directed two segments) and Martin Olson. The show’s outlandish characters were designed by David Mucci Fassett (credited as simply Mucci) and was animated overseas by Fil-Cartoons, Inc. Shuki Levy, Haim Saban (as Kussa Mahchi) and Deddy Tzur composed the music. Talk about a captive interview. Mad Jack was paired with fellow Saban property, The Secret Files of the Spy Dogs, during its original run on the network. However, while Spy Dogs went on to have a shorter second season, Mad Jack was ultimately cancelled due to poor ratings and was replaced the following fall by The New Woody Woodpecker Show. Its removal marked the last time it was seen in North American markets. The show has seen home media releases in Eastern Europe by Prooptiki and Turkey by Kanal D Home Video and has aired on Jetix Play in Turkey, following Disney’s 2001 acquisition of Saban Entertainment, and Fox Kids in Poland. “The Terrifying Sea Witch Incident” (9/12/98) – Jack escapes the island of the Three Witches with fellow prisoner Snuk in order to avoid marrying the lake monster. “The Curse of the Blue Karbunkle” (9/19/98) – Jack and Snuk have to go to the Isle of the Biclops to acquire a sword to defeat a dragon guarding a gem. “Of Zerzin, Fleebis, Queues and Cures / A Knight to Dismember” (9/26/98) – Jack tries to stay ahead of Mr. Death and get a cure for his ailment. / Jack takes a knight on a quest to rescue a princess but ends up having to rescue the knight himself. “The Strange Case of Angus Dagnabbit / Lights, Camera – Snuk!” (10/3/98) – Jack manages to trick Angus out of his Golden Haggis, but Angus’ ghost returns to reclaim it. / After seeing a film, Jack heads to a movie studio to educate them about real piracy. “Happy Birthday to Who? / Shipwhacked” (10/24/98) – Snuk takes Jack to an amusement park only he enjoys for Jack’s birthday. / Snuk causes them to be shipwrecked and Jack has a hard time coping with it. “The Horror of Draclia” (10/31/98) – Jack and Snuk attempt to steal Count Draclia’s golden wand, but Draclia was expecting and gets the drop on them. 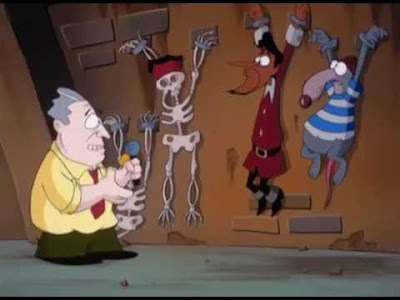 “The Treasure of the Headless, Left-Handed, Peatmoss Salesman / 999 Delights” (11/7/98) – Jack and Snuk end up arrested before their next quest and placed in the DMMV. / Jack steals a magic wand to go on a quest to find the Enchantress Victoria. “The Alarming Snow Troll Encounter / The Case of the Crabs” (11/14/98) – Jack and Snuk end up captured by the Snow Trolls after trying to retrieve their ice cream maker from them. / Jack and Snuk are captured by the Crustacians while searching for a pink pearl on the seabed. “Jack the Dragon Slayer / Captain Snuk” (12/12/98) – Jack sets out to rescue a princess from a dragon for a reward, only to find out the pair have fallen in love. / When an old enemy comes for Jack, he switches places with Snuk. “The Island of Pink and Fuzzy / Uncle Mortimer” (2/6/99) – Jack and Snuk head to an island of cuteness for a treasure that ends up being cursed. / To receive his inheritance from his uncle, Jack must take Scabby Doo to the isle of Hanna Barberians while avoiding his uncle’s ghost. “The Great Kapow! / The Snuk, the Mad and the Ugly” (2/13/99) – A starving Jack and Snuk are fed by island natives, not knowing they’re being fattened as sacrifices. / While in jail their cellmate tells Jack and Snuk about a treasure in the desert. “Attack of the Man-Eating, Green Gorillas / The Johnny of the Lamp” (2/20/99) – Jack finds a treasure shortly before being kidnapped by an old classmate. / Jack tries to reclaim his magic lamp from a sea monster only to be eaten by it along with Snuk and Angus. “Mad Jack and the Beanstalk / The Curse of the Mummy’s Toe” (2/27/99) – Beans taken by Snuk in a con end up growing a giant beanstalk. / Jack narrowly escapes a death trap only to be arrested for theft.